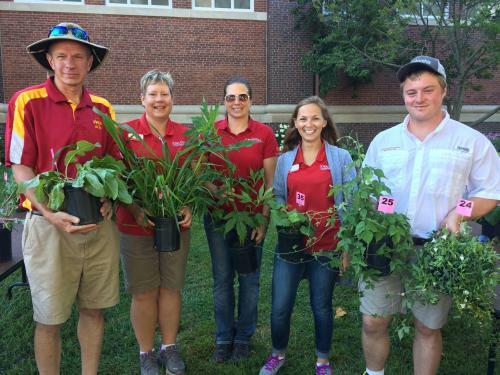 For the first time in recent history, a contestant successfully defended their title in the Professional Division at the State Fair Weed ID Contest. Cindy Recker of Peosta repeated as champion of the Professional Division, Karen Stiles of Des Moines won the General Division, and Henric Krause of Johnson took the Youth Division. Henric also successfully defended his 2016 title; Karen advanced from 2nd place in 2016, and will now have to compete in the Professional Division. Based on her score, the Professionals better up their game for 2018. Mike Pearson from IPTV's Market to Market competed, and demonstrated why he is a broadcaster rather than a practicing agronomist (his heart is in cattle). But it was great to see he had the 'courage' to put his limitations on full display. This year's scores were significantly lower than earlier contests, perhaps I was taking my frustration of not being present out on the contestants. The most difficult weed in the contest undoubtedly was Asiatic copperleaf (Acalypha australis). This plant was found in a few seed corn fields near Cedar Falls in 2016, prior to this discovery its only known presence in the U.S. was New York City. Two other unusual weeds were mock strawberry (Duchesnea indica) and Japanese stiltgrass (Microstegium vimineum). I found the mock strawberry in my backyard, I don't know how common it is in Iowa. Japanese stiltgrass is an invasive plant of woodlands that has recently moved into Iowa from the east. Infestations of stiltgrass were discovered in a new housing development outside of Iowa City in 2015. The featured plant family this year was the Cruciferaceae, or as we called it, a Multitude of Mustards. Included in the contest were field pennycress, tansy mustard, garlic mustard, and dame's rocket. I greatly appreciate Meaghan Anderson, Angie Rieck-Hinz, Eric Jones, John Hinz, and Dawn Refsell for running the show. The contest is always on the first Friday of the Fair, so reserve August 10, 2018. We'll be in front of the John Deere Agricultural Building with a new, challenging set of botanical misfits.